A review of the Brigade Reports reveals that the Hill of Allen Ambush was well researched, planned and executed — the only problem was that the enemy turned up late. 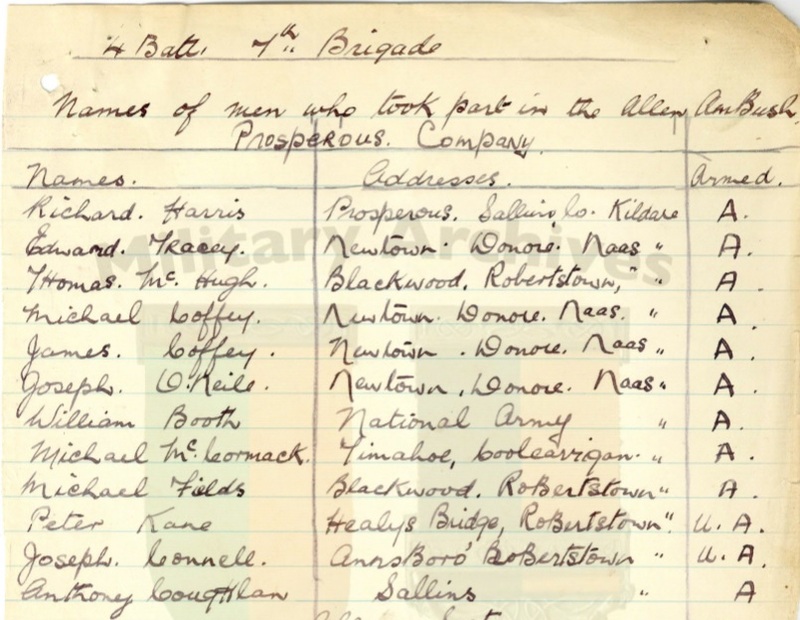 The following is the account contained in the Reports, and given by Edward Tracey, the commanding officer of 4 Battalion, 7 Brigade and Richard Harris, Vic Comdt of 2 Battalion. “In March 1921 it came to the notice of members of the Prosperous Coy that on almost every Sunday a contingent of Black and Tans and RIC were accustomed to travel by tender from Kildare town, to visit licensed premises in the Robertstown district, in order to enforce the Sunday Closing Act. The Battalion Council agreed to the plan made for the attack, and Richard Harris, at that time Batt-Vice Commdt, was put in chahrge with Edward Treacey, Capt Prosperous Coy and Michael Fitzgerald, Capt Allen Coy, second in command. “The Prosperous Coy moved their arms, consisiing of 7 Lee Enfield rifles, 12 bombs and about 12 shot guns, to an empty house on the roadside near where the ambush was planned to take place. “On Sunday, March 13th, 1921 the Prosperous Coy met at Newtown Donore, at about 11.30am and crossed about four miles over the boy to Allen, where they met the men of the Allen Coy. “According to plan, a farm house on the side of the hill was taken over by our men, and the men with shot guns placed in position. “Two men who had some grenade practice were placed behind a wall, beside which it was proposed the lorry would be halted, by rushing two farm carts across the road suddenlhy. “There was a steep fall away from the yard of the farm house towards the road and the cars could be pushed out by men under cover, and would run out on the road on their own momentum. “The seven rifle men were placed on the road side under the hill about 100 yards back from the place where the lorry was to be halted. They could, from that position enfilade the road. A man had been put in position high up on the hill, to signal the approach of the enemy. “All men were in position about 12.30. The enemy usually passed between 1.30pm and 3 o'clock, and as our position was unconcealed from civilian passerby, we had to hold up everyone who went by, and put them under guard at the back of the farm house. “We had to take this precation to prevent the news of the events from reaching Kildare town or the Curragh Camp which places were only four miles away. “We remained in our positions until about 6 o'clock, and as at that time we had some dozen cilivians held up and detained, and the residents of Kilmeauge village about a mile distant, knew what was occuring, we decided to abandon our positions. “The Allen Coy was first dismissed and the the Prosperous Coy started to move off. We had proceeded through several fields when someone heard the noise of motors. The order was given to double back, for the roadside, and we were within one field's breadth from the road (about 500 yards) when the lorry appeared. “The order was given to open fire and the lorry was met by a strong fire. The Tans jumped off the lorry, while the driver got it a tree that was thrown on the road. “They kept answering our fire until the lorry was on the straight road for Kilare town. They then raced for the lorry under the cover of the roadside bank, jumped in and got away. “Our 7 rifles fired about 100 rounds, and the men with shotguns fire a volley also, but at that range shot guns were useless. “It will be seen, that a matter of about 20 minutes saved the Black and Tans from destruction. “Nobody could be blamed for the failure of a well planned ambush, laid within sight of the Curragh Camp.